Harley-Davidson‘s (NYSE:HOG) US shipments declined 2% year-over-year in 2015, as stiff competition hurt the motorcycle maker. The stronger U.S. dollar gave pricing advantage to European and Japanese manufacturers. The U.S. is an important market for the company, since it forms two-thirds the net shipments, and 36% of the valuation of the company, as per our estimates. We currently expect the country’s heavyweight motorcycle market to grow at 4% CAGR through 2020, and Harley’s market share to drop from 52% in 2015, to 48% in 2020. However, if the dollar continues to remain strong, and Harley loses out to the newer model ranges of its foreign counterparts, as well as domestic competitors such as Polaris, its market share could drop to 43%. Moreover, the growth rate in the U.S. market could slow down to a more moderate 2%, after the initial spurt in sales over 2015-2016. Losing pricing advantage could also force Harley to lower its model prices. In effect, lower revenues would also lower the gross profit, and also impact the margin since Harley-Davidson has a considerable amount of fixed costs. 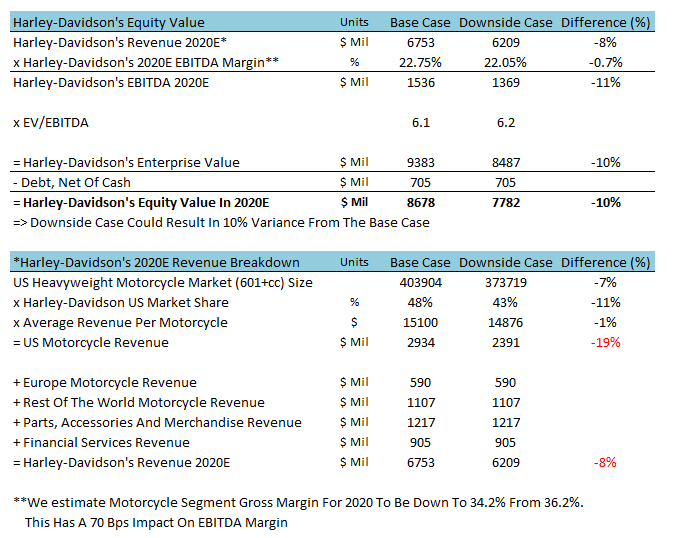 In this scenario, there could be a 10% decline in Harley-Davidson’s equity valuation, as per our estimates.